Plugfones are perfect for factory work, lawn care, motor-sports, air travel, students and more! 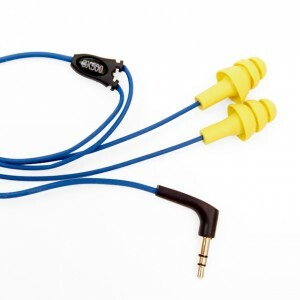 Plugfones will absolutely not fall out of your ear, ergonomically designed to stay in during anything rigorous. The work like headphones, but block out noise like earplugs! The hubby is always complaining about the various pairs of earphones he has acquired over the years. He always seems to find something that just doesn't feel good to him, whether they lack in sound or functionality. Seeing Plugfones, I had to get them for him to check out. The package arrived and immediately the hubby broke into it to check them out. typical white iPod earphones tossed aside. A few hours went by and I went to check on him, he still had the Plugfones in and was listening to his iPod. Excellent for work. They look and block out noise like safety plugs do. They block out the noise pretty well, have to say, and I like that they felt like any other earplug I had used. When wearing them, they are comfortable. Though the head of the earplug should be a little smaller, for people with small heads like I have got. My only dislike is the size of the plug that goes in your music player. The package says it fits Apple products, and it did, with a little extra nudge. I felt like I really had to push to get it in there. It went in though, works and is a great product!